Use a peg board to organize your cooking instruments. Put bags and cans of food in labeled bins to keep things organized. To save a bit of space with your shoes, make sure to store them this way. For your eyeware, just use a hanger. Store sports balls in the garage using cables. Mason jars make good bathroom storage. 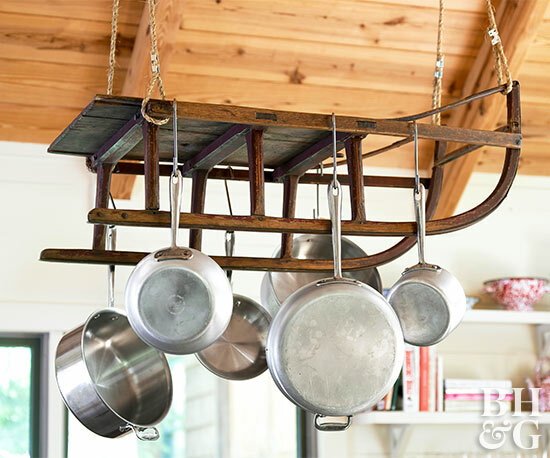 Creatively hanging pots overhead can save you space and add some personality to your kitchen. Repurposes old tins as magnets and to store pens and pencils. Glass bottles are a trendy way to store bracelets. Store your silverware more efficiently using this trick. Use a peg board to organize your sports stuff in your garage. Use pool noodles to keep your boots standing upright. Don’t forget to share these awesome organizational ideas (and this page) with your friends!